"Applewood-smoked bacon, cremini mushrooms, asparagus, and Asiago cheese all come together on a thin, crunchy flatbread to create a hearty and delicious main. Preparation may take some time, but the finished product is well worth every second. Serve alongside a fresh green salad for nice balance." Heat 1 tablespoon olive oil in a skillet over medium heat, and stir in mushrooms and garlic; sprinkle with salt and black pepper. Cook and stir until the mushrooms have given off their juice and the juice has evaporated, about 10 minutes. Remove from heat and set mushroom mixture aside. Heat 1 more tablespoon olive oil in a separate large skillet over medium-high heat until very hot, and place asparagus into the skillet. Cook, stirring occasionally, until asparagus pieces are very well browned (almost but not quite burned in spots), about 8 minutes. Remove asparagus from skillet and set aside. Reduce heat to medium, and cook bacon in the same skillet until crisp, about 10 minutes; stir often. Drain excess grease as the bacon cooks, for crisper pieces. Remove bacon pieces and place on a paper towel-lined plate; blot with paper towels to reduce grease. Place the flatbread crust onto the prepared baking sheet, and spread marinara sauce over the crust. Spread the mushrooms and garlic evenly over the pizza. 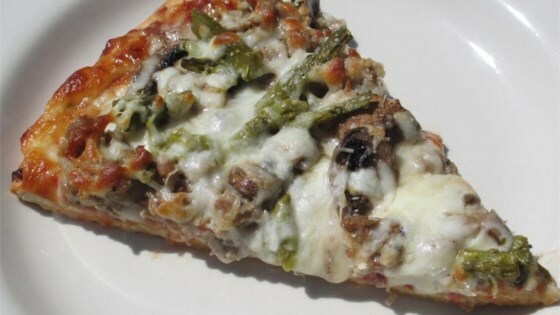 Spread asparagus over the pizza. Arrange bacon pieces on the pizza. Sprinkle mozzarella cheese all over the pizza, followed by Asiago cheese. Bake in the preheated oven until the cheeses are melted and bubbling, 12 to 15 minutes. If a crispier crust is desired, remove flatbread pizza from baking sheet, tear away aluminum foil and place back into oven after 8 minutes of cooking. made this for lunch with my sisters, they lovd it! I used turkey sausage instead of bacon. I will make this again, next time I will lightly grease the foil pan. This is delicious! Can't say one wrong thing about this pizza!